Economic anthropologists carry out research in all parts of the globe, producing ethnographic studies, cross-cultural comparisons and theoretical works. They explore how growing markets, new technologies and expanding capital affect marginalised people or the control of wealth between genders. The empirical studies of economic anthropologists are based on participation and observation and provide an information bank for testing formal theories. Their findings often challenge prevailing concepts of modern economics, because much of their collected information falls outside accepted paradigms or schemes. In this important collection, Stephen Gudeman has selected a range of seminal papers which highlight differences and convergence between anthropologists and economists, and which trace the major developments in economic anthropology from 1922 to the present day. The articles draw on the anthropological notions of culture and context, and examine economic processes such as production, exchange and consumption, and the application of theories, such as Marxist, institutionalist and neoclassical explanations, to field data. This authoritative volume will be an essential reference source for both economists and anthropologists. 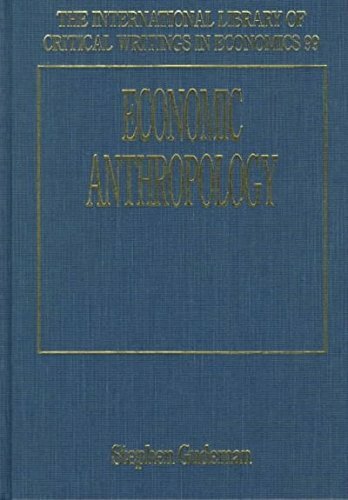 This selection of papers highlight the differences and convergence between anthropologists and economists, and they trace the major developments in economic anthropology from 1922 to 1998. The articles looks at such topics as culture and context and exchange and consumption.